As far as salads go, I am actually a little bit in love. Not with the quinoa, we still have issues, but combining quinoa with other things so that the quinoa is more of a sprinkling, than a main ingredient, definitely helps. 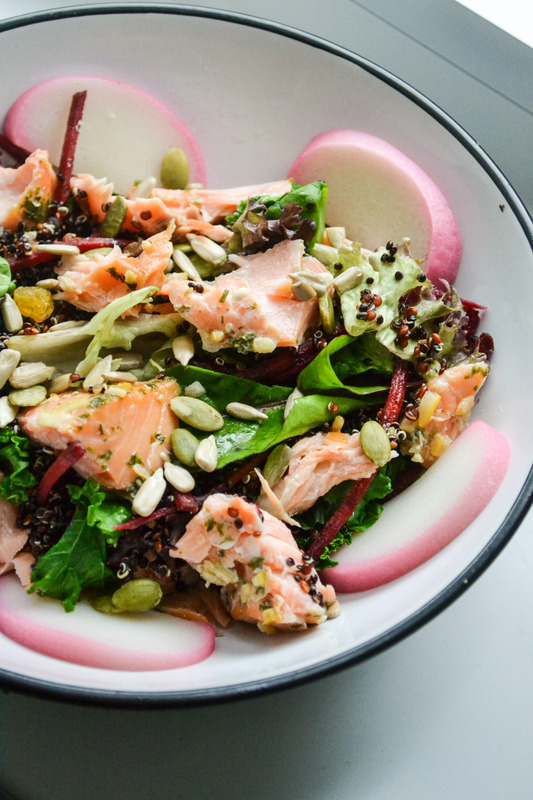 This salad is really easy to customise; just use the leaves as a base, the quinoa to help fill things up, and then add some protein–salmon, mackerel, chicken and so on–and various other bits and pieces, as you like. I didn’t need a dressing IMO because of the oiliness of the salmon, but a vinaigrette would go nicely, or even just good old balsamic. Rinse the quinoa in a fine mesh sieve to get rid of the slightly bitter coating. Heat up a saucepan with the quinoa and the water, until boiling. Turn down the heat, leaving it to simmer, covered, making sure there’s a small gap in between the lid and the pan to let some steam escape. Cook for ten to fifteen minutes until fluffy. If water remains at the bottom, remove the lid to let it evaporate. Turn off heat, and fluff up with a fork. Heat up a frying pan, and lightly dry fry the kale, letting the leaves darken and wilt. Add a drop of water if things are getting too hot, and let the water evaporate and thus steam the leaves, about two to three minutes. Turn off the heat, and slice up the Japanese fish cake. To serve, mix the beetroot sticks, quinoa, leaves and kale in a salad bowl. Add the salmon and Japanese fish cake, if desired, on top. Sprinkle over the seeds, and enjoy.